We’ve all become accustomed to “the smartphone stare”. You know, when someone is hunched over their smartphone, oblivious to the world around them, bathed in the glow of their smartphone’s screen. I admit, I can be found in this state several times on the average day. The magic of the “smartphone stare” is the magic of the personal electronics revolution: It’s the way that an electronic device can be made small enough that you can use it without sitting down. You don’t need a room in your house for it and you don’t need any special furniture. You just pull it out of your pocket and commune with a piece of electronics. When a piece of electronics can come with you anywhere you go and can be used at practically any time it becomes something more intimate. The “smartphone stare” might seem like a recent phenomenon, but videogame enthusiasts will recall that for them it basically started in 1989 with the Game Boy and Tetris, which for many people was the first really killer portable gaming experience. But, even before the Game Boy a handful of early adopters could be found basked in the glow of their handheld TVs. 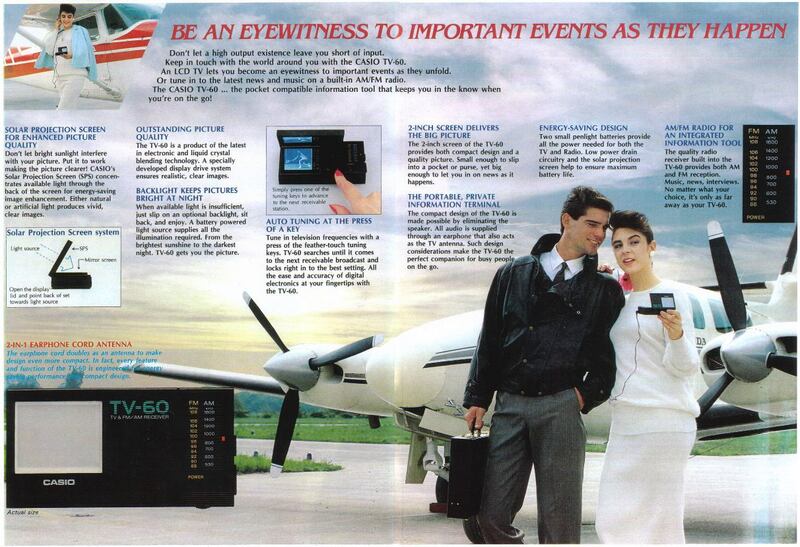 I have a particular affection for the various attempts to make a usable handheld TV in the 1980s. For one, I love the 80s styling. They’re like little jewel boxes of 80s chic. For another, these devices are relatively easy to find and even easier to store. Also, these devices were pushing the boundaries of what was possible technologically, and I respect that. Finally, I’m fascinated by how at the time these were esoteric luxury devices and today they are basically semiconductor trash. 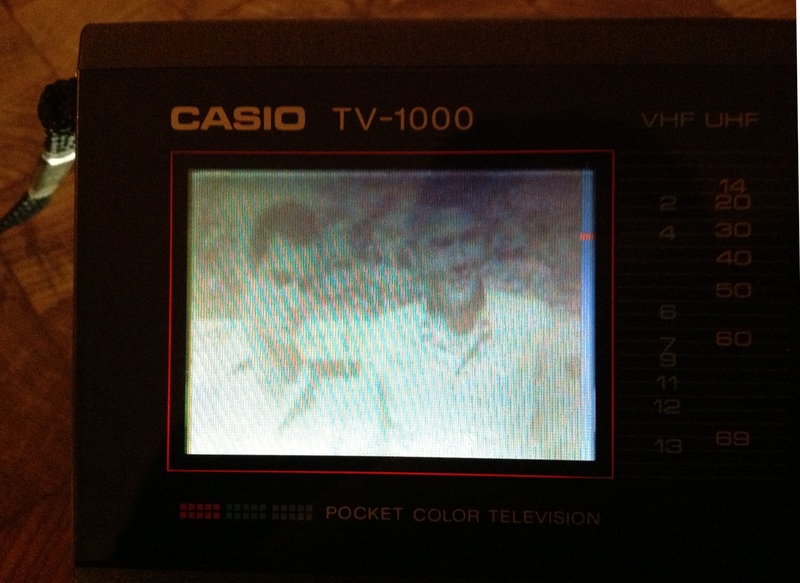 Of the vintage handheld TVs I own the Casio TV-1000 is my favorite. 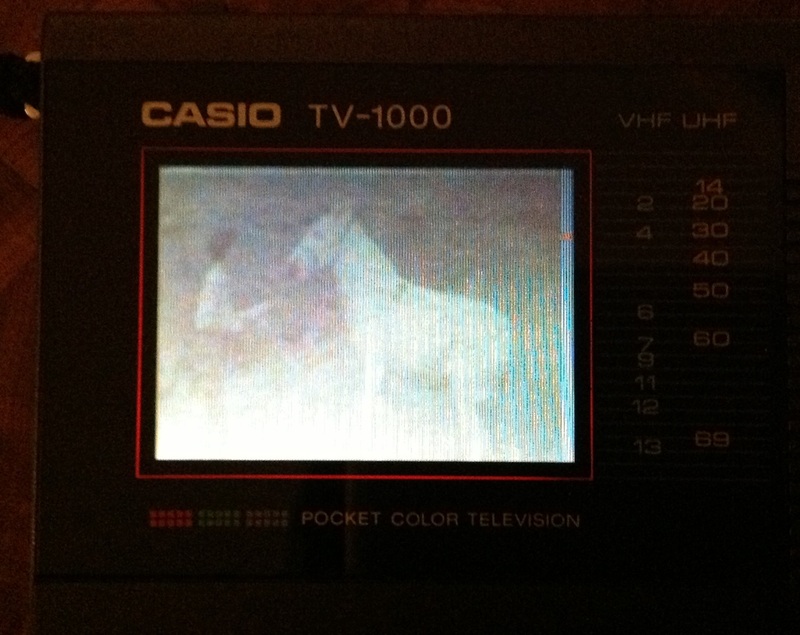 This was one of Casio’s first attempts to make a color LCD handheld TV. I found it at the Village Discount on State Road in Cuyahoga Falls with its original box, instructions, and warranty card. While it does have a backlight it also has an interesting feature where you can open up this door in the back to allow light in, as a way to conserve battery power. The part that folds down there is actually the battery compartment, which is smart because it gives that section some heft to weight the set while it’s folded down. 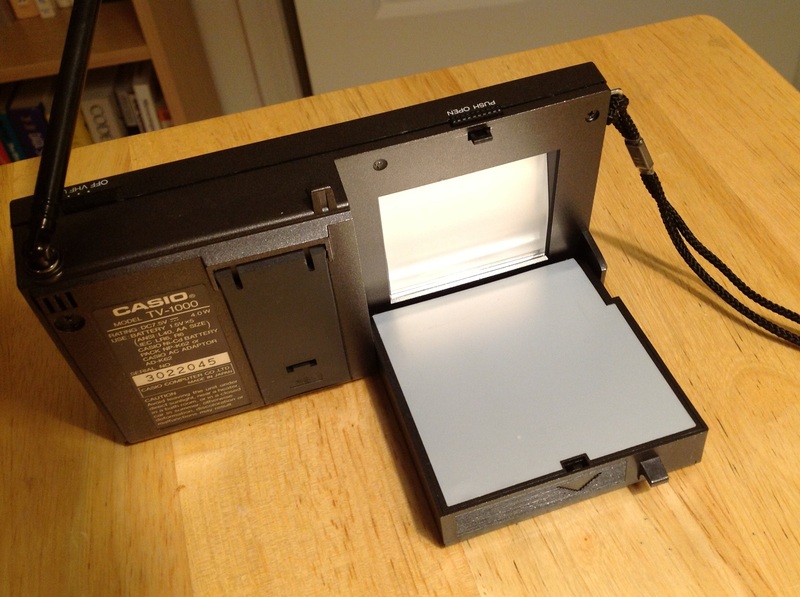 The interesting thing is that with that part open you can see the innards of the backlight diffuser, which is located at the bottom of that angled transparent section, and how it’s meant to distribute light across the screen evenly. Image quality, as one would expect from a mid-1980s passive LCD is atrocious. 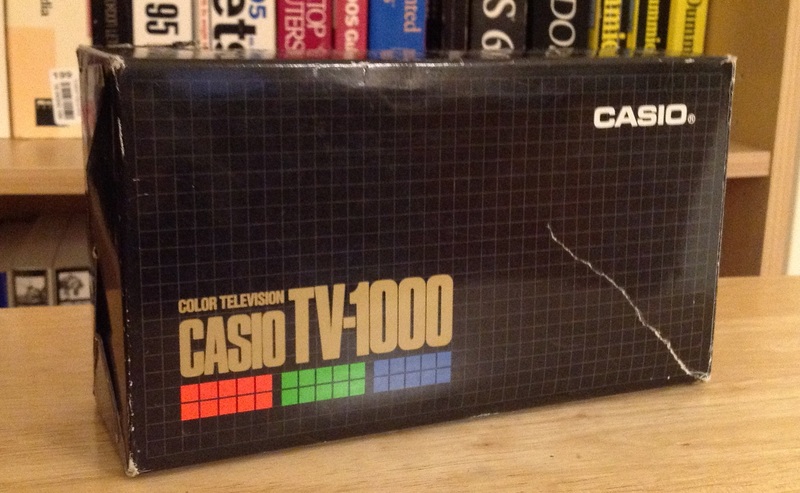 My understanding is that the TV-1000 was an attempt to produce a more affordable color micro TV than it’s contemporaries the Epson ET-10 and the Seiko T-102 and as a result it uses a passive LCD rather than an active LCD. I can’t say I’ve ever seen a passive LCD screen that was ever any good. Here I am trying to tune in one of the last low-power analog TV stations in the area, WAOH-LP (oddly enough, they were showing a black and white program). Notice the onscreen blue bar on the side with the red hash mark on the right side of the display. 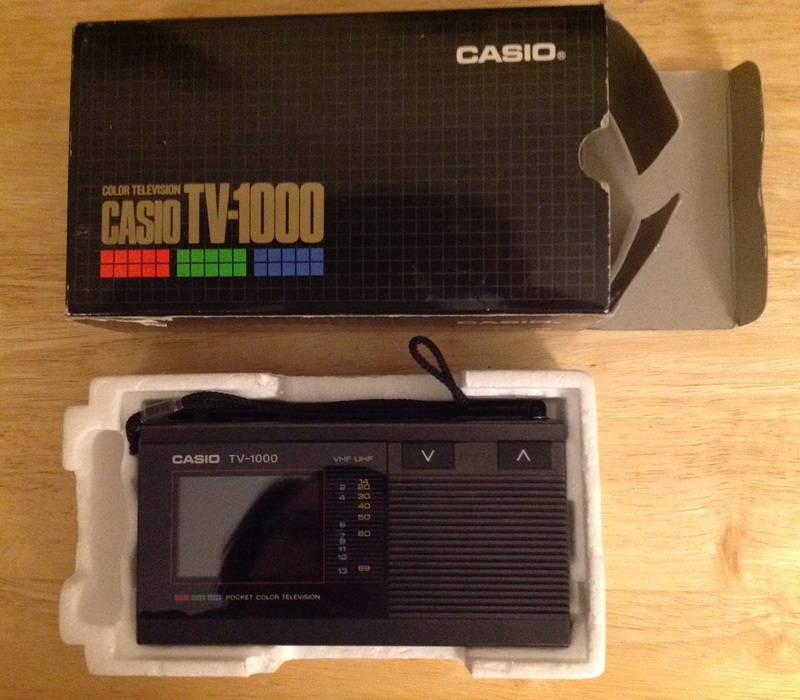 In order to tune the TV-1000 you would select VHF or UHF and then press the up or down channel button once so that it would start scanning for a channel. The red mark shows what channel it’s currently tuned to. The scanning process makes it difficult to tune in a marginal station because often it will scan right past. I would vastly prefer a manual tuning knob like the CRT Sony Watchman sets from the same era. But I suppose at the time this type of tuning seemed more high tech. 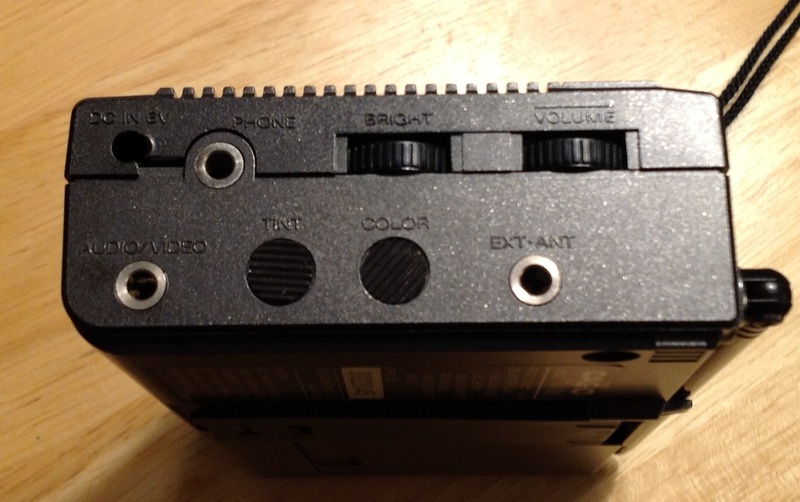 The TV-1000 also has a standard RCA 1/8th inch AV input, which is useful in the post analog TV doomsday. Use red/right for video and white/left for audio. 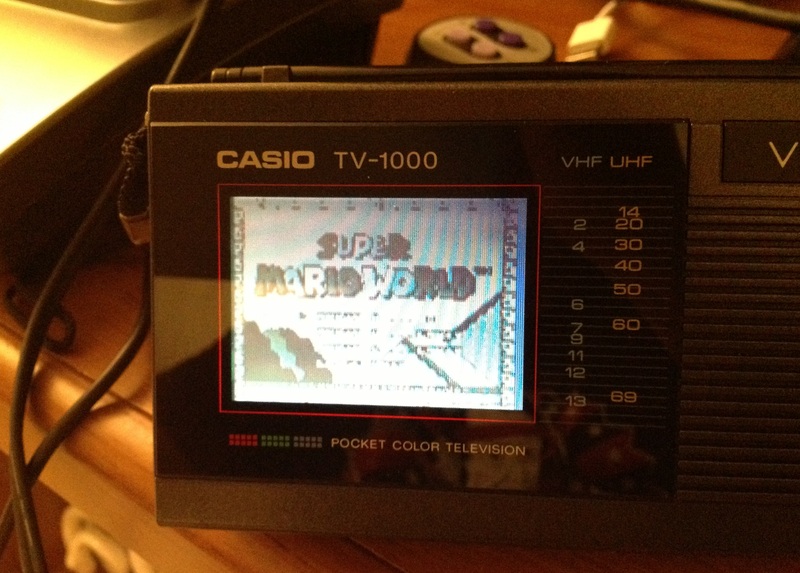 Here is Super Mario World on my Yobo FC Twin (which I shall discuss in the future). As you can see, the TV-1000’s color reproduction is awful, but that’s the reality of mid-80s passive LCDs. The sound however, is loud and crisp. 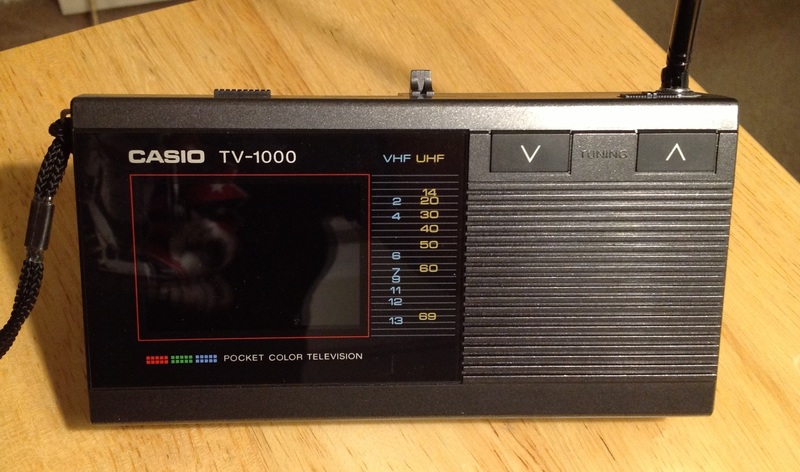 Right now the TV-1000 is the only 1980s-vintage LCD handheld TV I own, but I’m always on the lookout for others. 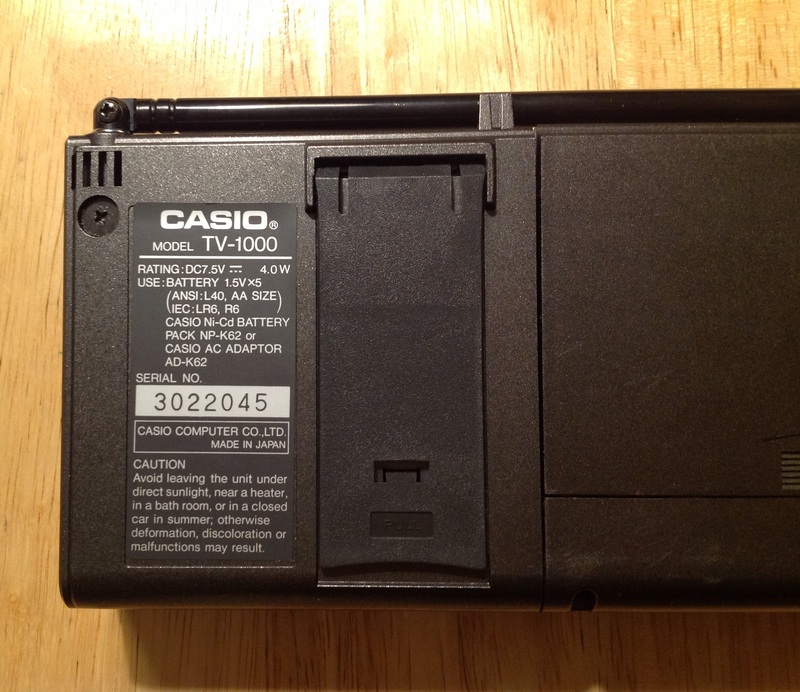 I do, however, have several micro CRT handheld TVs from the 1980s: A functional Sony Watchman FD-10A, a functional Sony Watchman FD-30A, and a non-functional Panasonic TR-1010P. wow… i have not seen this for ages. I use to have one of these way way back in the late 80’s. Do they still sell these little things? It’s basically a horrendous 7-inch screen with batteries and an ATSC tuner that can receive digital TV signals. It’s really one of the worst LCDs I’ve ever seen. There’s basically no angle from which the colors are correct. It’s also a comparatively low resolution screen so it has to down-scale HD which leaves lovely over-the-air HD signals looking awful. However, it was $20 new at Target in late 2010 so I feel like it’s a neat thing to own for that price. A friend of mine who works at Target told me it was an item they stocked as a Black Friday deal that no one bought. The big problem with handheld TVs today is that the 8VSB modulation that US over-the-air HDTV signals use is really not ideal for mobile TV. I think that’s why the Amazon listing for that Haier says “This TV must be stationary in order to function. It cannot be used while moving and/or in transit“. That’s because 8VSB has all kinds of issues with signal reflections. Other parts of the world use a different modulation so mobile TV may still work better there. My understanding is that Japan has a separate standard for mobile TV and that at one point there was a hardware add-on for the Sony PSP that not only let it tune in mobile TV signals but record them as well. You could use the PSP as a DVR and record onto the memory card. Wikipedia says that there exists an ATSC M/H standard that exists that would allow over-th-air HDTV stations to send a special signal for mobile TV. However, I don’t knwo if anyone is transmitting those signals or if there are even ant sets to receive them. Today it seems like the future of mobile TV is on smartphones through 4G, which is sad because I would rather see a free-to-air system.